A large crowd of Sampsons will be on hand to watch Corey coach and his son Darrien play O’Dea for the state title at the Tacoma Dome. First, the answer is no. Darrien is not the best football player in the Sampson household. 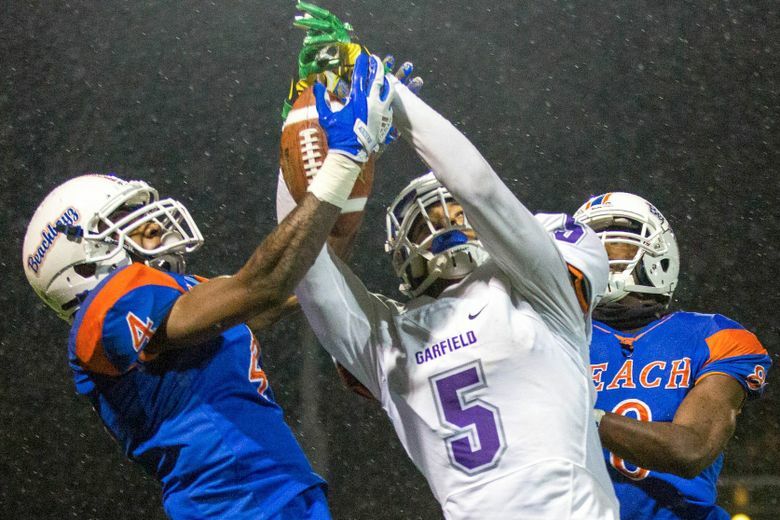 “Not just yet,” said the Rainier Beach senior cornerback. But Darrien has gone a step further than his father Corey, who coached the Vikings to Friday’s Class 3A state championship game. Rainier Beach (10-2) plays Metro League foe O’Dea (11-1) for the title at 7:30 p.m. at the Tacoma Dome. Richland (13-0) vs. Woodinville (13-0), Saturday, 7:30 p.m.
O’Dea (11-1) vs. Rainier Beach (9-2), Friday, 7:30 p.m.
Hockinson (13-0) vs. Tumwater (11-2), Saturday, 10 a.m.
Royal (13-0) vs. Meridian (13-0), Saturday, 1 p.m.
Liberty (13-0) vs. Kalama (13-0), Saturday, 4 p.m.
Almira/Coulee-Hartline (11-2) vs. Sunnyside Christian (12-0), Friday, 4 p.m.
It’s a first for Beach and the Sampsons, the eldest starring for Franklin’s 1990 and 1991 state semifinal teams. Corey went on to play cornerback at Northeast Louisiana where he was tied for fifth in the nation with six interceptions in 1995. Beach lost to O’Dea 49-28 in early October. The Vikings played without Darrien (hip-flexor), receivers Anthony Stell (suspension) and Mason Starling (foot), while offensive lineman Nathaniel Kalepo missed the second half due to the concussion protocol. Stell leads the team in touchdown receptions at 15. Senior quarterback Max Nall has completed 144 of 244 passes for 2,517 yards with 28 touchdowns and seven interceptions. In August, both Sampsons spoke of this week’s game being possible. Darrien with expected teenage brashness. Corey with the wisdom of an 18-year coach. He and his staff altered the practice style to help the players reach their potential. They even dismissed standouts who had attitudes detrimental to the team. Changes Darrien noticed immediately. The Sampsons anticipate 80 family members at the game Friday night. Corey’s grandmother moved with 13 adult children, including Corey’s mother, to Seattle when he was 9 for better job opportunities. He has cousins who also played at Franklin and remembered when Darrien was more interested in basketball than football. Darrien became as passionate about football and defense as his father by his sophomore year at Beach. That path has led to the Tacoma Dome. And Beach’s following has also swelled with each win. Some Seahawks players sent congratulatory videos and the organization opened its training facility in Renton to the Vikings for practice Wednesday night. Noted Beach alumni such as NBA star Jamal Crawford have wished the team well via Twitter while former NFL running back Corey Dillon, Sampson’s former teammate at Franklin, has attended the tournament games.